It is building up, we will be in Newport later so might duck into a pub watch the match. I Think Wales will win on home turf but it’s going g to. E a hotly contested game,.. and that’s from an Englishman who loves Spain more than his own country... say what you want! Playing in the People's FA Cup this afternoon but hopefully will get home in time to catch the second half. Never watched a game of posh rugby in my life. Typical old boys network plus coverage by the BBC for the establishment. Rugby league is the proper code in my opinion.but I hope Wales win . Not sure the Welsh team would agree with the posh rugby bit. Slightly anxious Englishmen as this is where we often come unstuck. I may need a few beers to survive the afternoon!!!! Like most team sports both Union and League suffer from the fact that the pitches were made for smaller/slower individuals, which has resulted in more rule changes than makes sense. Hence rugby 7's is bonkers but far more fun to watch 90% of the time. Got a mate that’s gone to the game , bought his misses tickets for her birthday ..
Was that really a present for her I wonder . Wrong on both counts mate. Coincidentally what's your forecast for tomorrow . onto man utd v liverpool today... has to be a Liverpool win yep ? Thought England did really well first half and would ease away in the second but a totally different side appeared in the second, full of indiscipline and loss of concentration. Well done Wales. England did not turn up for the second half ... thought that they would run away with it given the strength of the bench and their fitness , but just didn’t seem to want it as much and got sucked into Wales’s way of playing . As for the 5 past 2 . Flip Steve , I wish I had a crystal ball . Olie has turned it around for your lot , totally . Your a different team , which just shows you that those players where both being played out of possition and not bothering to play for the Special One . I just hope we turn up today and give it a real go . Lots of people saying we are starting to bottle it . I’m just happy we are in a position to be in contention with City as they are something else . Would be the worst day of the season if we lost to the dippers. Getting rid of the not so special one was at least 2 seasons to late, he shouldn't have been there in the first place but hey ho. OGS has certainly turned it round. Can only see a United win today even without Martial. I would present city with the premier league trophy myself if it stopped the mickies winning it. Couldn't think of anything worse. End 29years of hurt mate , just hope we don’t have to wait till 30 . 30 + will be just fine with me mate. OMG who has thought of that kit ? 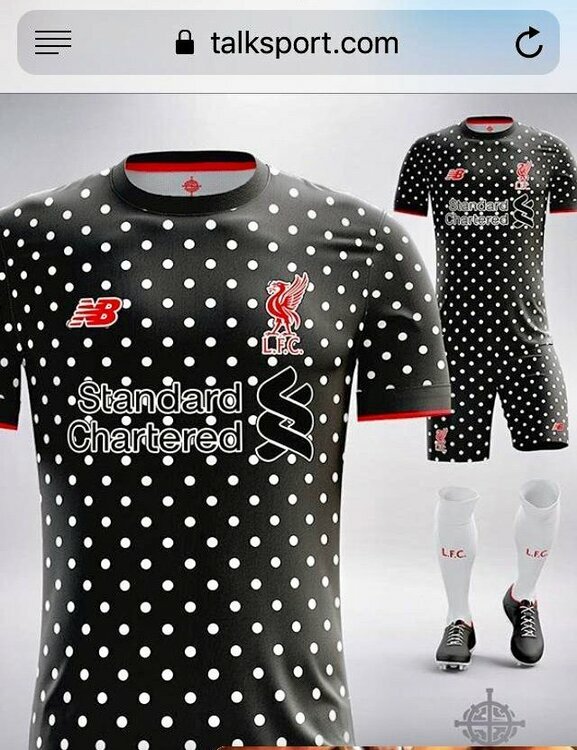 That's even worse than our infamous grey away kit . Only a concept kit at the mo - let’s hope it stays that way ! 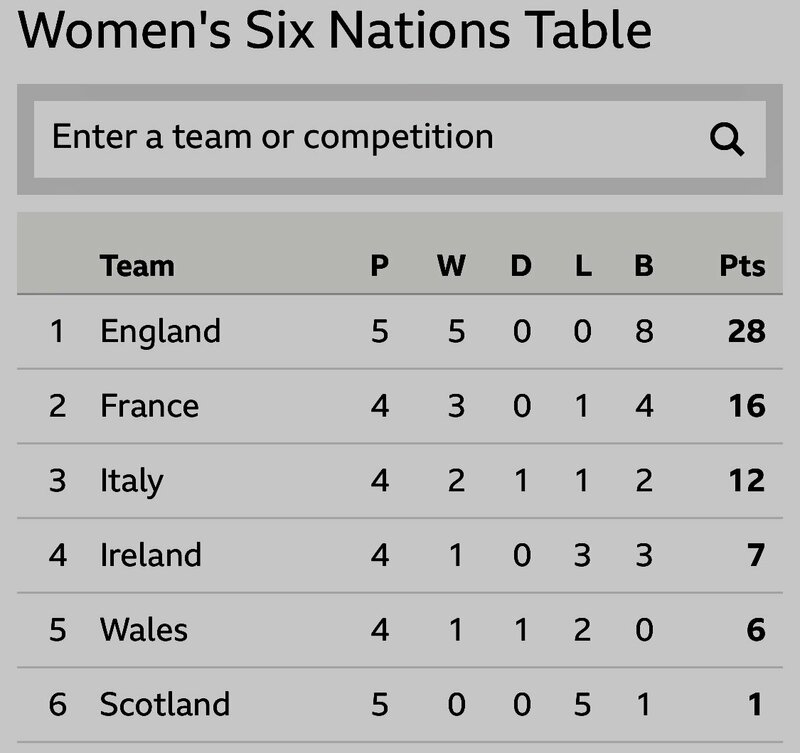 Real big shout out to Englands women’s team though . Yet another convincing win with some amazing forward play and handling. Sarah Bern once again massive at Prop, but also has the pace and sidestep of an inside centre . What a player . Does Brendan Rogers deserve the hard time... ? For me it’s more about the timing ... than him going . I’m sure a lot of Celtic fans will be left wondering why .. why now when so close to the treble treble .. why go to a club that will never ever have the fan base of Celtic .. The answer I think is I’m afraid to say , money and the prestige of the Premiership .. not really the attraction of Leicester as a club, sorry Leicester fans. Can he get them back into Europe ? Can he get them to chase for a Premiership title again ? I think also he was not getting the backing of the board to be able to really go out and spend big , so they get a chance to go further in Europe . Was he right to go ... maybe , but maybe for me at the end of the season would have been better . One thing Celtic fans shouldn’t forget is the legacy he’s left. As big a club as Celtic are they play in a league with no competition. Moving to us with a bunch of young players, 80 million pound new training ground being built and ground expansion on the way is obviously a new exciting challenge for him. Singing songs about killing him for moving justifies the move alone. Says a lot about Scottish football that Brendan Rodgers would consider moving to a mid table premier league side. Could have sat tight and waited to see if/when the Spurs and Chelsea jobs become available. looking like the weekend could be a turning point? It could well be Mike . We lacked the cutting edge up front and not got a strong enough bench in depth as City has , or the experience at this stage of the season to push on . It may well prove a step too far for us , but it’s still only one point and some interesting games to come . Ok just throwing this out there , but what if , and it’s a long shot I know , but what if Utd beat City and that proved to be the game that gave us the title . Couldn't happen .. could it ? 10,000 + fans of all ages watched them beat Italy 55-0 today in Exeter ..
Great to see the women’s game taking big strides and as a spectical good to watch . The draw will take place on Friday, March 15 at UEFA headquarters in Nyon, Switzerland. teams to avoid...? teams to play...? But over two legs ... I’d take us to match most now ... maybe Porto is the easiest draw ... then Ajax but no easy draws now . VVD and Mane where immense tonight . if it was seeded guess the seeding be something like this ? I guess your right Mike and you would think that would make sense , but whatever the draws are on Friday, we are in for some more fantastic nights of European footy . Going to make the end of the season interesting as well if Liverpool and City progress to the semi , look at the fixtures then. Never rule out Barca and Juv’ ..
Juve favourites for me but anybody left in capable of winning it. Would you credit it .. you should be a bookie Mike . Some mouth watering matches and despite what everyone says , there are no easy games at this stage , home or away . The Champions League just gets better and better , can’t wait for that music to start again. And don’t forget the England’s women’s team play at 19.30pm v Scotland to confirm the Championship and the Grand Slam ... they have played amazing rugby and raised the women’s game to new heights . raised the women’s game to new heights . I’d lock the door behind you Steve , as you don’t want any of the England women’s front row following you in mate . Showed our boys how to keep a lead .. well done Wales though . Great performance from England's footballers last night.